Heading to the Jersey Shore? More particularly, are you heading to the Wildwoods? If so, one of the nicest places to be on the entire Wildwoods islands happens to be North Wildwood, at least in my honest opinion. We personally love North Wildwood because it's situated on the northern section of the island. It's a slower-paced area, a little bit more quiet and not as crowded as some of the other areas. We also find that lodging accommodations seem to be a lot more affordable in this section and the hotel, motel & resort staff's seem to be a lot friendlier. 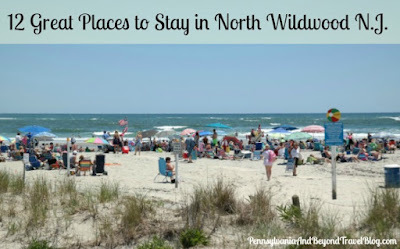 Here's our top 12 Great Places to Stay While Visiting North Wildwood in New Jersey. 1. Aloha Oceanfront Motel - When it comes to oceanfront, you can't get any better than the Aloha! We've stayed over 10+ times at this place in the past 16 years and have always enjoyed our stay. The beach is right across the street and you'll get some beautiful views of the ocean from your window (if staying in an oceanfront suite) or if you're sitting on their large sundeck. 2. Acropolis Oceanfront Resort - This resort sits right across the street to the Aloha. They have an Olympic sized swimming pool, large sundeck and all of their rooms offer views of the ocean. We stayed here one time many years ago and while it was okay, it wasn't one of our favorite places to stay. 3. Athens II Motor Inn - If you're looking to get some of the best ocean views that Wildwood has to offer, Athens II has to be on the top of your list! They have a heated swimming pool, balconies, hotel rooms, suites and even a penthouse to accommodate large families or groups. It's a tad more expensive than some of the other places on our list, but definitely worth it for the views. 4. Harbor Light Family Resort - This place used to be at the top of our list of places to stay. However, over the past 2-3 years, a lot of families are staying there and partying out on the sundecks & in front of their rooms until 3am in the morning. As you can imagine, it's hard to get a good night's sleep if your staying there during the months of June, July & August. With that said, their staff is super-friendly, the rooms are always extremely clean & they have two swimming pools for you to enjoy. 5. North Wind Motel - This motel sits right across the street from the one listed above. They offer 2-room efficiency units and 2 bedroom units. They have a nice sized swimming pool. We never stayed here but did tour one of their rooms when my cousin's were down visiting last year. They looked nice from what I could see the few minutes that we were there. 6. Trylon Motel - A few years ago we stayed at the Trylon and it was an "okay" place but not at the top of our list to stay at again. The week we were there, people were outside partying on the sundecks & in front of their rooms until the wee hours of the morning. In addition, our room was not that clean and the maid-service was terrible in our opinion. They offer a variety of different styled rooms and do have nice ocean views. They have a swimming pool, shuffleboard, etc. all on-site. 7. Montego Bay Resort - We stayed here twice and really enjoyed this place! We had a gorgeous 3-bedroom suit with hot tub. Our balcony gave us beautiful views of the Atlantic Ocean. 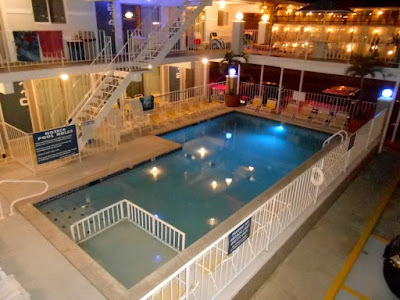 My family enjoyed time down in the swimming pool & indoor waterpark. My husband and I both enjoyed a great body massage! The restaurant is a bit pricey and the food is okay, not fantastic, but good. 8. Jade East Motel - This is a smaller motel located in a more quiet section in North Wildwood. If you like a relaxing & quiet time when you're visiting the Jersey Shore, this is definitely one place to consider. They offer a few different room choices and feature a swimming pool with surrounding sun deck. 9. Condor Motel - This hotel offers several different types of accommodations ranging from motel rooms, suites and a very large apartment with 3 bedrooms. They have a nice swimming pool, sundeck with bbq grills, a hospitality room and more. Definitely worth checking out because their prices are very reasonable. 10. Harbor Mist Motel - This hotel sits in a more quieter area in North Wildwood, but yet...it's only steps from the beach & the Atlantic Ocean. They offer different styles of accommodations, have a nice sized swimming pool and a small grilling area set up with bbq gas grills. Their prices are extremely reasonable for being this close to the beach! 11. Isle of Capri Motel - We never personally stayed here but my aunt and uncle have stayed here several times & recommend it. For that reason alone, I'm including it on my list. They offer several different styles of rooms, have a swimming pool, poolside barbecue and seem to be very affordably priced. At least in my opinion. 12. Matador Oceanfront Resort - This resort is oceanfront and gives you some pretty views of the beach & Atlantic Ocean. Sitting right near the resort is a nice playground for the kids to play in. They offer a variety of different sized rooms & styles of accommodations and have a large heated swimming pool for you to enjoy. Well, there you have it. Our list of 12 hotels, motels and resorts that you can find on North Wildwood in New Jersey. They all offer something a little different in different locations and at a variety of prices. Enjoy your vacation down to the south Jersey Shore! I am glad to have this list of places to stay. I definitely would avoid the ones where the guests were out partying very late. My 2 favorites e the Aloha Oceanfront Motel and the Montego Bay resort.